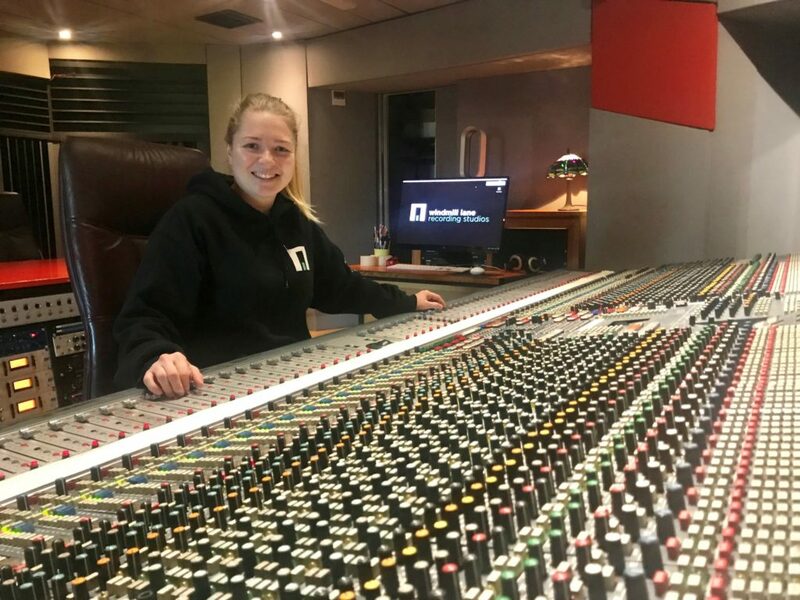 Nicole has been doing such a fantastic job in the studios here in Pulse College recently, we thought she deserved to feature in our blog this month! Nicole, can you tell the readers about your background and how you got the opportunity to do the internship? Of course! Well from a young age, about 8, I started to play the guitar and used to write songs and play covers but as I got older I became really interested in how music was recorded and produced. Over time I became fascinated by the technology side of things. I liked it more than playing and writing music and I wanted to know how things like Pro Tools and Logic worked. I did a short diploma in music production, which I found very interesting and I knew then that I was on the right path in terms of progressing a career in an area I’m passionate about. I did quite a bit of research online, and this is where I first came across Pulse College. I thought the Audio Courses looked pretty cool but wanted to be sure so I headed along to an open day. When I arrived, I knew straight away it was the college for me. I got to chat with the lecturers and see the whole place. I was blown away by it all and decided to enrol in the BA Degree in Music Production. It’s a three-year degree course which I just finished this August. The course is great, and you cover tonnes of things along the way. In Year 1 the class spent a lot of time getting to know the inside of a studio. Each student was coming from a different background and some had more experience than others so there were lots of different learning curves. In Year 2 I really enjoyed the training we got on recording music and sound for film. We learned about ‘Foley’ – something that was new to me. Foley is where you use various objects to reproduce the sounds in a movie: footsteps, bouncing a ball, opening doors etc. It’s a really interesting and fun area, not a lot of people are aware about it but it’s used in every movie we watch! In the second year we also worked with clients and did studio recordings. This would have been with a band or solo artist and it gave us great practical experience. I worked with one amazingly talented solo artist. She played guitar and piano and wrote her own material. We did a lot of planning in pre-production, finding out her sound and influences and then recording her in the studio. We added different elements and layers to make the song sound full. At the end I mixed and mastered the whole recording for her using Pro Tools. In the final year we really focused on implementing the skills we’d learnt in the first two years. We got to work in the studio a lot more with a bunch of different clients. The aim was to make the final product sound as professional as possible. We covered several business modules too. I think this was quite important, we learned about aspects of the music business, song writing royalties, producer royalties, how to work as a freelancer, IMRO. It’s good to have that knowledge to take with you into the real world. Also, in third year, a dissertation had to be completed. It began in September and was submitted in August the following year, so it was a big piece of work. Each week we met with our supervisors to discuss it, track progress and make sure everything was going ok. There were two options: a written only dissertation of 10,000 – 12,000 words or one with a practical component and the written section being 7,000 – 8,000 words. I liked the idea of having a practical element and I thought long and hard about what to do. I have a big interest in technology and how the whole thing as evolved and continues to do so. I carried out a lot of research and decided to have a go at building my own Theremin! I planned how I was going to build it, got all the components, studied the design schematics, and picked up a solder to start working. Unfortunately, it only kind of works, the electronics were a little bit beyond me, but I learned so much. I now know loads about capacitors and resisters which are used so much in the mixing desks in recording studios. I’d be almost comfortable opening one of them up now!! What have you been up to on your internship? I also then need to be on hand throughout the session in case there’s any issues with cables or if the headphones are causing problems for the musicians. On top of that I help out with the new students. They all need to book their studio time to get their project work done so I’m busy coordinating parts of that for them. Then I’m around to help out if they have any difficulties during the recording sessions. It’s very busy and great fun, I really enjoy it. That’s a tough question, there’s a lot of options. The post production side of things in Ireland is booming. There seems to be lots of opportunities in Film and TV sound and that’s an area that I find very interesting. I love it here in Ireland, I have lots of friends and my family are here but down the line I might even move abroad to experience some more studio work. The world is my oyster!! This entry was posted in Audio Engineering, blog. Bookmark the permalink.